Here you'll find musings on books that carry some sort of magic. It could be fantastic prose, an enchanting world, or pure narrative transportation. Usually this will take the form of literary fiction, narrative nonfiction, memoir, fantasy—and anything else that I find magical. Like many of us, I have a tendency to buy books, proceed to never read them, and spend a lot of time reading other books. Here, I unflinchingly examine the books I have allowed to grow dusty on the shelf, and promise to do better. . . someday. 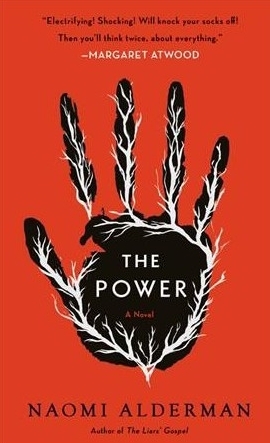 In light of the resurgence of The Handmaid's Tale, The Power is a must-read for anyone looking for the satisfaction of sci-fi empowerment, along with a big picture examination of the nature of consequences. This book looks you straight in the eye and places its hands gently but firmly on your shoulders. You are equals. I compiled a list of seven of my favorite fictional manors, mansions, and castles, and the way they almost become characters in the stories they're a part of. The perfect read if you've secretly always wanted perfect oneness with kindred spirits in an ancient Irish estate. I took a rare adventure into murder mystery and now I can't stop. In the Woods is a journey into the mind. I needed a good travel book and Powell's came to the rescue. From where I sit on the couch, I can see books I bought at the bi-annual library sale, from the Goodwill, that have been given to me as gifts. Somehow I keep checking out books from the library and I prioritize them because they'll be due soon. I could easily put off the reading of the books I already have indefinitely. But I will be a better person, a better writer, and less of a hoarder if I read the ones I have, which I acquired for good reason and with good intentions. Dune: Frank Herbert - Beloved by many—I'm told it's the best book ever. I got about forty pages in but I was busy and there were talking heads and I couldn't get into it. But I will read it and love it someday, I promise. We Were the Mulvaneys: Joyce Carol Oates - It's so long, and so dark. But it's her 26th novel and loved by all, including Oprah. Oates must be doing something right. Walden: Henry David Thoreau - On the beauty of avoiding humans, or something along those lines. I think I'd like it. And the box set I have is really pretty. The Trial: Franz Kafka - I have fond memories of getting this book for something like a dollar in a little store in the San Juan Islands, where I was finding myself. Love in the Time of Cholera: Gabriel Garcia Marquez - I studied him and the literary movement he spawned (magical realism) in college, but I couldn't get into this. I don't remember why. I think I found it tedious. But some classics we must suffer through. Tenth of December: George Saunders - Okay, I read one story, and I never once forgot that I was reading. I found his work to be self-conscious, which made me self-conscious . . . But I was told once or twice that my writing (or attempt at it) is vaguely reminiscent of Saunders, so I should read him, right? Infinite Jest: David Foster Wallace - Who am I kidding? The Secret History: Donna Tartt - I should make it a goal to read books by Pulitzer Prize-winning authors. If I don't happen to own the book that won the prize, another one will do. The Brothers Karamazov: Fyodor Dostoevsky - People have told me this book changed their life. I like the people who've said this. I wouldn't mind my life being changed so I'd be more like them. This one is currently is looking really good right about now. When will I read this books, and in what order? I don't know; I just checked out three more from the library. But, when I do read them, where should I begin? I keep hearing about Celeste Ng! Always the exclamation mark after. I found Little Fires Everywhere on the “It’s Your Lucky Day!” shelf at my library. It was the very book I was looking for—so yes, it was a lucky day indeed. The hero of the story is Mia, a thirty-six-year-old single mother, photographer, and nomad. She’s a deeply talented artist with a vision she follows doggedly. There is something mystical about her. Everything about the way Mia lives defies society’s expectations. She is loved by the characters and also by me. It may seem irresponsible for her to drag her child all over the country, never staying in one place more than a few months, but I got over that quickly. She’s figured out a way to live that is right for her. So few of us ever find that in our own lives. We never even get to know ourselves well enough to figure out what “the right way to live” means for us. No matter how hard we try to avoid it, we end up doing what’s expected. The story is really about the various ways people react to Mia. The other characters are enchanted, they are jealous, they admire her, they reject her. As a result, they go out of control in their own unique ways, while Mia remains unaffected by it all. Through her, the book tackles the problem of our age: the supposed utopic suburbia; accommodation to the expectations of society; the symptoms of said accommodation; the rejection of it; the reaction to the rejection. The concept itself is not groundbreaking. Millennials have been making complaints based on this theme since we became millennials. Ng applies this theme to the concept of motherhood. Not very trendy, but ubiquitous. Even millennials sometimes become parents these days. More and more often, they choose not to, but it is always on our minds, always on the table, because it is always a possibility. And with modern medicine, it looks different now. There are . . . options . . . for becoming, or not becoming, a mother. Questions are raised: Is it kidnapping if you take your own child? Is it wrong to give your child away? Who decides such things? Does it matter? What makes this book special is that all these options are explored neutrally. No single one is right or wrong. There is no judgment. I was dog sitting my buddy Hank while I read. When I first read a synopsis of the book, it was described as a masterful examination of race. Yet, for the first several chapters, no racial issues were brought up, no characters of color appeared. I began to speculate: perhaps the mother-daughter duo, Mia and Pearl, are black. Any mention of anyone’s complexion is carefully avoided, but what little physical description is offered does not rule out the possibility. (It’s a Hermione Granger situation—remember when a black actor was cast to play her? And what’s wrong with that? Nothing!) I was thrilled with myself for figuring it out. I couldn’t wait to get to the part where the reader could be expected to figure it out for certain—because I thought maybe it would remain implicit, with no big reveal. I won’t say whether or not my theory was correct, but I will add here that there is a rather central storyline involving a custody battle over a Chinese baby. This book oozes MFA. I want to hate MFA programs, especially the prestigious ones, and the writing of the writers who emerge from those programs. I want to support the scrappy, poor writers who have made their own ways and developed their own styles. We should each have our own journeys rather than adopting some institution’s idea of perfect, drilled into us for far more money than we will ever earn. And yet, against my better instincts, I love these fancy writers. I can’t help but adore Ann Patchett for the absolute whopper of a story that is Bel Canto. The same goes for Celeste Ng and Little Fires Everywhere. As someone who struggles with writing plot, I’ve spent the last few days ruminating on the perfectness of this one. Everything ties so neatly, so perfectly into the narrative, to the intention of the story. I may even map it out in order to study the construction of the story. This book is extra special among its MFA peers because of its readability. I expected a cerebral exploration of the meaning—or lack of meaning—of something. I wouldn’t be able to read much of it when I was winding down for bed. It would be rewarding and totally worth it, but not always easy. I did not find that to be the case this time. Little Fires Everywhere is a quick and easy page-turner that doesn’t compromise its intelligence. Allow me to personify. This book looks you straight in the eye and places its hands gently but firmly on your shoulders. You notice that you are the same height. The book is not wearing elbow patches. The book is not trying to be anything; it just is. And it is your equal. So: Are MFAs good? Are they bad? Does it matter? The central study of this book is not unique, but its thesis is. The vaguest of spoilers below. The characters don’t always do what’s right—but who’s to define that? When these characters break out of their molds, they roam free and wild and unapologetic. To break free, damage is done. The rules of society are so strict that, to be broken, they must be shattered. There may be casualties. But does that mean we should never become ourselves? No—once we find the guiding force of our lives, we must follow it. Morality is relative. Weird stuff happens in these buildings, and people get weird there. Perhaps that's why many of my favorite books take place in old houses. I often write about old houses in my own fiction. There are mysteries and conflicts built into the walls. I would like to share seven of my favorite old manors, mansions, and castles, and the way they almost become characters in the stories they're a part of. I've also selected some musical accompaniment for you. I’ve already gone on about Whitethorn House in my last post, and reading it prompted this one, so I will simply reiterate that this setting is a wise play: who can resist the gothic draw of a young woman entering an old house that is hers to roam and to be haunted by? Of course, there is the ultimate, the Harry Potter series. We’ve got more magical buildings than we could ever hope to list—don’t get me started on the coolness of 12 Grimmauld Place or The Burrow—so I will focus on Hogwarts. The castle was built in the late Early Middle Ages (c. 993) and consists of seven storeys, according to the Harry Potter Wiki (which fortunately did not exist when I was in middle school, or else I never would have emerged from the ether—even now it’s difficult not to get sucked into the vortex). Hogwarts is quite literally haunted, with ghosts milling about. Pictures don’t appear to be looking at you; they are looking at you. It’s built with J.K.'s own brand of altruistic magic. Says Dumbledore, “Help will always be given at Hogwarts to those who ask for it.” The building itself is sentient and aligns itself with good, which is demonstrated when it locks Dolores Umbridge out of the Headmaster’s Towers. Good castle. It is the ultimate home for orphans, with food appearing on the table and plenty of secret (read: forbidden) places to explore . . . and to hide. Another icon. The best possible amenity of an old house is a portal to another world. Who didn't spend hours pushing on the backs of closets and cupboards as a child? I personally knew my own home, built in the 1970s, wouldn't have such a thing, but any house over a hundred years old was fair game. Talk about secrets. Mary Lennox finds her freaking cousin tucked away in the back of Misselthwaite Manor. Also, it seems pretty likely that the uncle’s dead wife is haunting the place. Honestly, I think the garden is overrated compared to this hundred-room house. Thinking about I Capture the Castle now, I may just need to reread it. When I first discovered it, I swore to tell no one about it because it felt too personal. I felt that the story was about me. But I’m something resembling a grown-up now and I’m okay with you guys knowing about it. I kind of recognize that other people relate to the story, but I'm pretty sure I'll always love it more than any of you. Not that it's a competition. Two sisters live with their depressed father and eccentric stepmother in a decaying castle in England. They’ve run out of money since they bought the castle, so their lifestyle is humble and relatable. The heroine, Cassandra, spends her days writing in her notebook and generally hanging out around the castle. She’s left to her own devices and her own imagination, and she makes the most of it. She daydreams about whether it would be better to be Jane Eyre or to be in a Jane Austen novel. She sunbathes naked on the top of the turret without fear of being seen, but she's able to see what’s happening below. I've read this book four times and am itching to read it again. I could go on about it forever, but I'll stick to Thornfield Hall. What is really significant about this house is what it's hiding. Like all good, old houses, there is a forbidden area. Jane is not to go up to the third floor. If somehow you haven’t read Jane Eyre yet, I won’t reveal the secret; the rest of you know what I’m talking about. This secret makes the house itself inherently alive, and sinister. And yet this is the place where Jane finds happiness and love. In a gothic novel like this one, nothing can be purely good. Everything is complicated. And then Thornfield, along with its complication, is destroyed, and the characters start fresh in a new house. I’ve never been fully satisfied with this ending. The new house is gloomy and unfamiliar. I bonded with Thornfield, with the gardens, with the fireplace where Mr. Rochester and Jane had conversations and fell in love. "All these relics gave . . . Thornfield Hall the aspect of a home of the past: a shrine to memory. I liked the hush, the gloom, the quaintness of these retreats in the day; but I by no means coveted a night's repose on one of those wide and heavy beds: shut in, some of them, with doors of oak; shaded, others, with wrought old-English hangings crusted with thick work, portraying effigies of strange flowers, and stranger birds, and strangest human beings—all which would have looked strange, indeed, by the pallid gleam of moonlight." Though a good read in its own right, Rebecca strikes me as a poor man’s Jane Eyre. Young, poor woman marries older man, the first wife is a lurking, lingering presence haunting the home, there is a part of the house where the heroine must not go, and then the house goes up in the flames. But we love Jane Eyre, we need more Jane Eyre. So I’ll let it go. Like many of the authors in this list, du Maurier based Manderley off of an old house she discovered and fell in love with. Then she bought it on impulse. I relate, Daphne. I would've done the same thing. Of course there are others. Every Jane Austen novel, for example. But I couldn't be bothered to go over Mr. Darcy's Pemberley or any of the others. They don't speak to me. There are some short stories too that I highly recommend: "The Masque of the Red Death" by Edgar Allen Poe, the fairytale "Bluebeard", "House Taken Over" by Julio Cortázar. What are your favorite fictional houses? I binged The Likeness in about two and a half days—something I’ve not done in a long time. I couldn’t stop reading. This book, another murder mystery by Tana French, packs in the double-whammy of a whodunnit and the immersive magical experience of a fairytale world. I didn’t expect to want to be in place where a murder had occurred, but I did. I haven’t been this enchanted with a fictional world since I was a child, and this one takes place in the suburbs of Dublin. Theoretically, it could be real. This is not your typical crime story. It is more of a surreal prose poem, from the very beginning, from the prologue. Looking back, I see that the ending is given away almost from the first page. The story is not about what happened, but why, and how. This statement is followed by Cassie, after integrating into the house, beginning to feel that she is truly alive. That deeper self that is so seldom awakened is allowed to thrive. Cassie feels she’s returned home, even though she’s never been to Whitethorn House before. I think many of us are homesick for Whitethorn House: to live in a mansion with four kindred spirits who perfectly understand and accept you, to shut out nasty reality and live in the 19th century except with electricity, to discover secrets in the upstairs room, to live in a perpetual summer with endless days that turn into sparkling evenings spent reading in front of a crackling fire. It's similar to the part in Jane Eyre where she conveniently bumps into her awesome cousins and they save her life and everyone gets along great. Idyllic but doomed to temporality. Each of the four roommates are fully formed and flushed out with the level of detail only a detective would notice: how they carry themselves, how they interact with one another, how much they're hiding. They're complex and enigmatic. No wonder Cassie falls under the spell. No wonder I did. Not unlike Thelma and Louise, the mythical victim, Lexie Madison, joins the ranks of wild and free women who refuse to be bound by society, by reality. They run for the sake of it, because that’s who they are. Even though this makes no actual sense and in all counts leads to premature death, it is inspiring. Live free or die. Cassie takes something away from living Lexie’s life and begins to live more fully in her own. (I think? It's unclear how much she's actually capable of such a thing.) Good for her, but I’m not modeling myself after a murdered person. I was a bit suprised by the mixed, leaning-towards-negative reviews. I totally agree, the premise is out-there: Cassie, the former partner of Rob Ryan, main character of In the Woods, goes undercover when she finds that someone who looks exactly like her has been murdered. That person had assumed Cassie’s undercover name, Lexie Madison. Cassie seamlessly inserts herself into the victim’s life to find the murderer. It just so happens that the victim lives with her four kindred spirits in pastoral, communal bliss. There are obvious issues with this: it’s pretty darn unlikely that you could have a biologically unrelated doppelgänger, and then that you happen to have experience as an undercover cop, and that you could pick up your doppleganger’s life right where they left off. There’s a lot that doesn’t makes sense. It bothers me but I also don’t care. I’m too busy caring about the characters and wishing I could be the sixth member of their cult. I’ll go over a few issues I slightly care about so as not to appear a synchophant. A Frenchie, if you will. There was no reason to turn this murder investigation into an undercover operation. But an undercover agent got involved. If you ask a surgeon what to do, they’ll say surgery; if an undercover gets his way, he’ll say undercover and fight for it to happen. The impulsivity of these cops is scary; we’re at the mercy of their curiosity. The police performed an experiment on real people, and destroyed four lives. This bothers me so much because the characters feel real to me. The killer—I won’t tell you who—leaves something to be desired. We never get to find out about this person’s backstory, or the reasoning for the murder. Doesn’t the satisfaction of a murder mystery lay in knowing why a killer did what he did? We are deprived an origin story, the ultimate mystery, just as we were in In the Woods. Tana French is a tease. The Likeness has joined the ranks of my favorite books. I’m not giving it five Goodreads stars because of the above qualms, but it’s a five in my heart. I miss reading this book and wish I had it to read over again. Your turn; go read it. What is it about murder these days? Detectives are like early Greeks inventing constellations—gathering limited, scattered facts, like stars, together in coherent pattern using only intuition and a bit of imagination. The collection of stars mean nothing if you don’t know what you’re looking for, but the trained eye picks out the shape and draws in the gaps. It’s an addictive puzzle I’ve only recently discovered. I believe I can trace this back to the holidays and my binge-watching of The Keepers on Netflix. I need to know what happened. I still think about it. But what I watch and what I read are two different things. I decided to try out In the Woods by Tana French as a vacation book, along with The Golden Compass, which I wrote about last week. It had been highly recommended to me by friends and by podcast critics whose opinions I trust. I barely even knew it was crime fiction, just that it was good. I ditched my copy at my BnB in Guatemala. I’m sorry, it feels wrong to me too! But I had overpacked and it was one less thing to carry. Plus I was sending it into the world, most likely to be found be a backpacker trading in one book for another. And I wasn’t disappointed. What I go for in literature is the beautiful lilt of a sentence that captures a moment or idea in a newer, deeper way. French is a master of this art, applying her lyrical prose to the gritty realities of human nature and modern society. It’s the psychological component that draws me in to crime mysteries. That’s probably what it is for all of us. What happens in the mind of the killer, the victim, the detective? What games do we play with one another and with ourselves? French explores these ideas from the inside. In the Woods works because the reader is completely in the narrator Rob’s head. You experience his trauma, his addictions, his inability to be honest with himself, and most of all, his attempts to access blocked memories of the moments that tore his life apart. You’re with him as he self-sabotages every aspect of his life. You become as frustrated with him as he is with himself, yet you’re helpless to stop it—just as helpless as he is. Rob’s inner mind is unique; he’s not put into the box of a diagnosis. But if you’re into that sort of thing, there are some interesting explorations of psychopathology. I wish those explorations had gone deeper, but they serve their purpose in the narrative. French takes on a first person almost-omniscient tone I am exploring in my own writing. Omniscient in the sense that hindsight is *practically* 20/20. The narrator addesses someone (the reader?) from an unknown time in the future. Why does Rob feel the need to tell this story, to make his own confession, so to speak? We are left to speculate. There is a power to this form of narrative, in that the story can be told completely. First person is limiting in obvious ways; the story is skewed by one character’s perception. Third person can be more comprehensive, but lacking the intimacy that draws a reader in. First-person almost-omniscent draws from the best of these two perspectives. The two-pronged narrative approach is deadly effective. The novel explores two mysteries that occurred in the titular woods: 1) the murder of a twelve-year-old girl, and 2) the disappearance of two children twenty-some years prior. Two incidents that may or may not be related. When one storyline slowed down, the other one kept me going. There’s nothing like the mystery of a forest filled with supressed memories and potential magic to keep the pages turning. There are moments throughout the novel that capture the inherent misoygny of—what? The 2000s? Cop culture? Ireland? Our world? Female characters are introduced to every scene first by their physical features and perceived level of attractiveness. What interests me about this is that we have a female author writing from a male perspective. In that scenario, I’d think that the male gaze would not be so accurately captured. I wonder: does this mean that French is incredibly adept at entering the mind of her character, or that she herself is (or was) not entirely feminist? If the former, I wonder that Rob is never reprimanded for his thinking, either indirectly through events or by other characters. What would be the point of such effective execution of sexist thinking, if not to perpetuate this mindset? For this reason, I fear the latter, a slight lack of wokeness. But it really is slight; the female characters, particularly Rob’s partner Cassie, are pretty darn badass. In terms of quality and quantity, Tana French is our era’s Agatha Christie. In fact, think it might be these two rockstars dominating the universe of literary mystery. Has any other era had an Agatha Christie? Can any other author compare? I know little about this genre, so let me know who I’m missing! In the Woods is the first of French’s Dublin Murder Squad books. While they do not quite constitute a series, they share the same world and the same cast of characters. What changes is the narrator; a different character gets to tell the story in each book. And that’s what French does best. She gets inside the head of a character and takes you with her. I know, I know—everyone has read this book already. Everyone loves this book already. But I hadn’t, and when faced with a trip to Guatemala involving seven planes and lots of sun, I needed a good travel book. So I scoured Powell’s for a read that would engage me while I was alternately trapped in the iron maiden that is an airplane and lounging by the Lago Atitlán, known as the belly button of the world. And I found The Golden Compass. As soon as I saw it, displayed proudly on a stack of copies of itself, I knew it was my choice. It’s so endorsed that I was guaranteed not to regret having the extra 1.3 pounds of luggage. For many readers, if His Dark Materials isn't their favorite series, it’s a close runner-up after Harry Potter (which, to my mind, is perfect). It wasn't until after I finished the book that I learned BBC is going to create a TV series. I love BBC for always doing it up right. I can't help but think the Dust was guiding my decision. Guatemala has tons of dogs! This one in particular was very friendly - he came right up to me while I was reading and leaned. I love a good leaner. The Golden Compass is an enjoyable romp through another world. I haven’t romped in far too long. There is nothing like a solid YA/children’s fantasy to get my mind off the mechanics of life and go to a magical place. And how else would I want to live my life? I loved the concept of the dæmons—the animal companion to every human, their soul made physical, and furry, and cuddly. I would almost venture to say that the desire to have a constant animal friend, especially one that you can communicate with telepathically, is universal. We would never be lonely! I cheered on the friendship between Lyra and Roger. Boys and girls being friends at that age is uncommon, and I appreciate Pullman’s rebuke of such an unecessary segregation. Why shouldn’t boys and girls of any age be friends? We’re all just people, after all. Lyra’s total disregard for societal expectations is refreshing, inspiring, and increasingly relevant. Characters like her help us to see what can be imagined, which is the first step to making it possible. I will say I think I missed the boat on this book. It's meant for a younger audience, and this jaded reader struggled with a few aspects. Spoilers below. For example, our young protagonist Lyra finds out who her parents are halfway through the book—one of them kidnapped her and the other pretended to be a distant uncle her entire life. Lyra seems pretty cool with it, considering. She doesn’t take any time to absorb the shock and betrayal. She isn’t distracted at all from her mission to save Roger. Heroic of her, yes, but also not very human. But these humans are in a parallel universe, so maybe family ties work a little differently there. Things just work out. Obstacle: solution. Obstacle: solution. I was never worried when Lyra got into a scrape because she always gets into scrapes and either 1) a magical friend comes along to help or 2) the other character she’s up against isn’t very bright and is easily manipulated by a not quite twelve-year-old kid. I wasn’t even worried about her finding Roger—who is supposedly awesome, although I can’t confirm that, having spent only a couple pages with him at the very beginning—which was the whole point of the book. But these are my problems, not the book’s. If only I could have read it when I was eleven, I’m sure I would have felt differently. I’m looking forward to reading the next two books, particularly the final installment of the trilogy, The Amber Spyglass, which won heaps of awards. After that, I believe I’ll more fully understand why His Dark Materials is such a beloved series. And I can't wait to find out what the heck Dust is!